This is my first foray into fan fiction. Normally I don't like working in worlds that aren't my own, but since I use mostly original characters, I've managed. Right now I have two fan fic projects I'm working on. One is based in the Star Wars universe, about four hundred years before the movies. The only character from the movies that is seen in it is Yoda, and he only has a small part. I also borrow a bit from the book The Courtship of Princess Leia, something few but the most avid Star Wars addicts will notice. 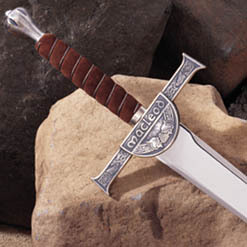 The other is based on the movies and TV series Highlander. Recently I applied to join Hellmouth Muck, an online role-playing forum that joins several TV series together. I applied for an immortal character on it, and then I started writing fan fic for this character. The muck has been shut down, but my character lives on in my fan fic. If you want to send comments, complaints, corrections, or if you just want me to let you know when a new chapter is up on my fan fic, email me at tirade@lycos.com. And hey, for all you Star Wars fans out there, I've created a website called Cheapsabers. It sells cheap hardware saber replicas for fans, and for fan films. You can find it here, at http://cheapsabers.tripod.com/. All Star Wars characters used in this fan fiction are copyright to me, with the exception of Master Yoda, and a small mention of Exar Kun, who was created by Kevin J. Anderson. If I use any other existing Star Wars characters, I will mention them in this. The Star Wars universe is, of course, is copyright to George Lucas and 20th Century Fox. I only WISH I could claim it as my own. All Highlander characters used in this are copyright to me, but the rest, of course, are copyright to whoever the hell owns Highlander... if you wanna see for yourself, go the the Highlander website... I don't remember offhand, and I'm too lazy to click on my own link there. But all the active characters in my stories were created by me. Only the ones briefly mentioned, like Conner McCloud, Ramirez and the Kurgan belong to the creators of Highlander.